Paul Youngman Named Associate Provost at Washington and Lee Youngman succeeds Marcia France, who becomes dean of undergraduate studies at Duke Kunshan University in China. Paul Youngman, the Harry E. and Mary Jayne W. Redenbaugh Professor of German at Washington and Lee University, has been named associate provost of the university, beginning July 1. He succeeds Marcia France, who has held that post since 2017 and has been named the inaugural dean of undergraduate studies at Duke Kunshan University, in Kunshan, Jiangsu Province, China. As associate provost, Youngman will lead a number of university-wide initiatives, including student summer opportunities and the Summer Research Scholars program. He will co-chair, along with Human Resources Director Mary Main, the University Committee on Inclusiveness and Campus Climate (UCICC), which is the university’s principal committee on diversity and inclusiveness. He will support faculty development and take a leading role in curricular reform, student projects and faculty initiatives. The appointment was announced June 1 by W&L Provost Marc Conner. Youngman serves as the head of W&L’s Department of German, Arabic and Russian, is the founding chair of the Digital Humanities Working Group, and former chair of the International Education Committee. He came to W&L in 2012, having taught previously at the University of North Carolina- Charlotte. He holds a B.A. in business administration from W&L, and an M.A. and Ph.D. in German literature from the University of North Carolina-Chapel Hill. His research focuses on the German cultural reception of various technologies. He is the author of two books, “Black Devil and Iron Angel” (Catholic University Press, 2005) and “We are the Machine” (Camden House, 2009), and has spoken and published widely on nanoscience and technology. His most recent book publication, “Complexity and the Human Experience” (Pan Stanford, 2014), is an edited volume featuring computer modeling applications in the humanities and social sciences. He is a veteran of the U.S. Army and a recipient of the Bronze Star with “V” device. France began her career at W&L in 1994. She holds an S.B. in chemistry from the Massachusetts Institute of Technology, an M.S. in chemistry from Yale University, and a Ph.D. in chemistry from the California Institute of Technology. 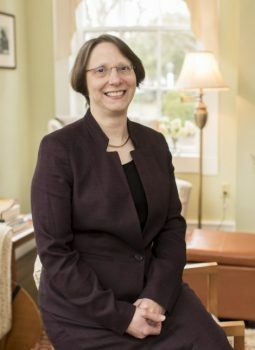 She served as associate dean of the College from 2012 to 2017. She helped develop and has served as co-director of W&L’s partnership with the University of St. Andrews, in Scotland, which provides a study-abroad opportunity for W&L students studying science and preparing to enter a health profession. She also created and teaches the Science of Cooking course, in Italy. In her new role at Duke Kunshan University, France will oversee both the degree and non-degree undergraduate programs. She will be responsible for the strategic development of undergraduate academic programs, developing and implementing all undergraduate academic policies and procedures, undergraduate academic advising, undergraduate program assessment and study abroad. Duke Kunshan University is a Sino-American partnership of Duke University and Wuhan University, offering a range of academic programs for students from China and throughout the world. A non-profit, joint-venture institution, it opened in August 2014 and initially offered master degree programs and an undergraduate global learning semester. It will welcome its inaugural class for its undergraduate degree program in August 2018. “I am honored to be invited to serve as the inaugural dean of undergraduate studies at Duke Kunshan University,” said France. “It is amazing to have the opportunity to build a new undergraduate liberal arts program in China. The dedication and energy of the students, faculty and staff I met during my visit was truly inspiring. I very much look forward to joining this global community and playing a key role in implementing the innovative, interdisciplinary curriculum DKU is about to launch.